Eastern gambusia (Gambusia holbrooki - also known as plague minnow, gambusia and mosquito fish) are native to south-eastern USA. They were initially introduced into NSW waters sometime during the 1920s because of their reputation for mosquito control. However, since that time their ability to control mosquito larvae has been shown to be no greater than that of small native fish that feed on insects. Eastern gambusia are now common in NSW waters and throughout Victoria, Queensland, Western and South Australian waterways. They have impacted several threatened fish species in NSW directly through competition and predation. Size: Females to about 60 mm, males to about 35 mm. Eastern gambusia may also be confused with female and juvenile Pacific blue-eyes Pseudomugil signifer, which have a similar shape and body colour, and it is only the forked tail-fin of the Pacific blue-eye that distinguishes them as a different species. Small native fish such as the Midgely’s carp-gudgeon Hypseleotris spp. 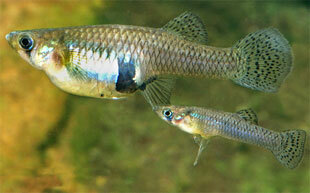 are similar in size and appearance to Eastern gambusia and may also be confused with Eastern gambusia. The native Pacific blue-eye Pseudomugil signifier (top photo) and Midgely’s carp-gudgeon (bottom photo) are similar in size and appearance to Eastern gambusia and may be confused with Eastern gambusia. Eastern gambusia are widespread throughout NSW and thrive in shallow slow flowing waterbodies. They can tolerate a wide range of temperatures and water quality. 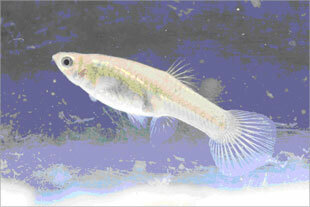 Eastern gambusia can reproduce several times a year throughout the warmer months. Eggs are fertilised inside the female and take 3 or 4 weeks to develop. About 50 young are born live and reach maturity in less than 2 months, which means populations of Eastern gambusia can grow rapidly. What are the impacts on native fish? Eastern gambusia has been implicated in the decline of several threatened species in NSW including for example, Oxleyan Pygmy Perch, Southern Purple Spotted Gudgeon, Southern Pymgy Perch, Murray Hardyhead and Olive Perchlet. For further information view the listed threatened species, populations, ecological communities and key threatening processes page. Eastern gambusia have been associated with the decline of abundance or range of 35 fish species worldwide, including at least 9 Australian native species such as gudgeons, hardyheads and some rainbow fish. 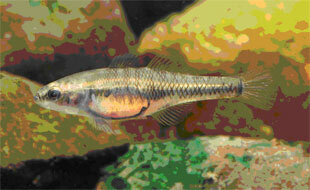 Eastern gambusia are known to compete with native species for food and resources. They can behave aggressively towards other species by chasing and fin nipping, which can lead to secondary bacterial or fungal infections and potentially death of other fish. Eastern gambusia feed on a wide variety of foods, including insects such as ants and flies as well as aquatic beetles, bugs and other fauna. The high reproductive rate and extended breeding season of Eastern gambusia, along with broad feeding habits can enable this species to overwhelm suitable habitats with juveniles and deplete food supplies. 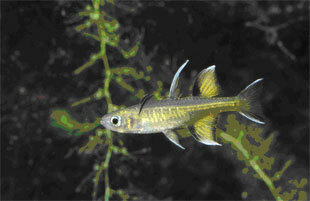 Eastern gambusia are known to prey upon the eggs and juveniles of other fish species. They have also been linked to the decline of frog species, through the predation of tadpoles and adult frogs. The introduction of fish to fresh waters within a river catchment outside their natural range is listed as a key threatening process in NSW. A list of strategies have been adopted for minimising the impacts of this threatening process and are set out in the NSW DPI Priorities Action Statement. ​For further information view the Priorities Action Statement - Actions for introduction of fish to freshwaters within a river catchment outside their natural range (KTP)​ page. While control options are limited for introduced pest fish species, there are some options that improve the odds for native species, like habitat rehabilitation, stocking native fish and, movement restrictions. It is illegal to translocate live fish between waterways in NSW - and heavy penalties apply. NSW DPI discourages the sale and possession of these pests through its ongoing advisory program, that educates key stakeholders and the general public about the threats associated with pest fish, how to reduce their spread, as well as information on NSW prohibited and notifiable fish listings. On 1 July 2017 the NSW Government implemented the new Biosecurity Act 2015 (the Act). Under the Act people are expected to have a basic level of knowledge about the biosecurity risks they might encounter in their normal work and recreational activities. All community members have a responsibility to consider how actions, or in some cases lack of action could have a negative impact on another person, business enterprise, animal or the environment. We must then take all reasonable and practical measures to prevent or minimise the potential impact of biosecurity threats on the economy, community and the environment. What can I do to stop the spread of aquatic pests? Give unwanted aquarium fish to friends or a pet shop, rather than letting them go in the wild (Note: it is illegal to release live fish into NSW waterways without a permit, and penalties apply). Design backyard ponds carefully to prevent the unwanted release of fish during heavy rains – for example, by using screens on overflow areas. Wherever possible stock backyard ponds with native species endemic to your local area. Be on the look out for new species in your local waterways. If you find a fish that you think might not be native to the area, freeze the fish whole and report it to DPI. If you find what you believe is a new sighting of a pest fish, freeze it whole and Report it! Harris, JH and Gehrke, PC (eds). 1997. Fish and Rivers in Stress. The NSW Rivers Survey. NSW Fisheries Office of Conservation and the Cooperative Research Centre for Freshwater Ecology in association with NSW Resource and Conservation Assessment Council. Lintermans M. 2007. Fishes of the Murray-Darling Basin: An introductory guide. gambusia on native fishes of the Murray-Darling Basin. Arthur Rylah Institute for Environmental Research, Department of Sustainability and Environment, Heidelberg, Victoria.